The Greater Columbia Region will be honored in June at the Association of Defense Communities National Summit in Washington, DC as a Great American Defense Community (GADC). 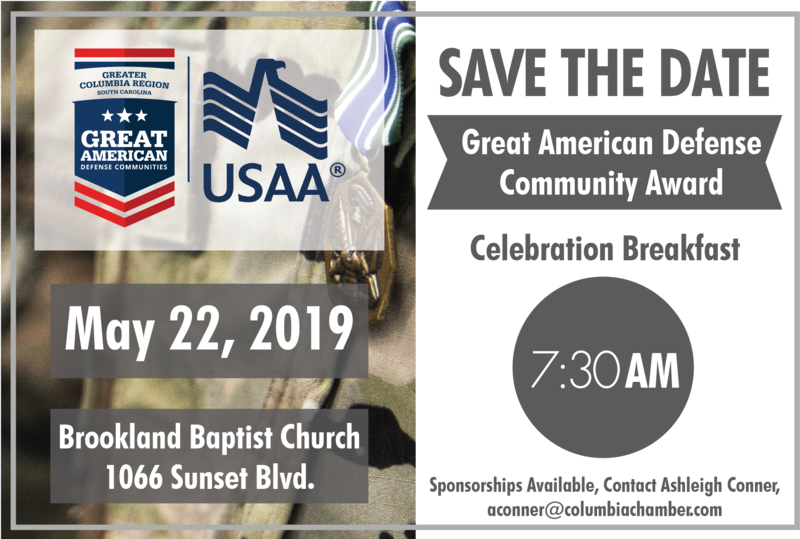 To celebrate this award and all of the organizations that help make us a GADC Community, the Columbia Chamber will host The Great American Defense Community Celebration Breakfast on Wednesday, May 22, 2019. This breakfast will salute our partners who support the military and the honorees highlighted in the GADC nomination – the Chamber’s Military Outreach Group, including the USO and SC Military Base Task Force, WIS TV Year of the Veteran, Fort Jackson Educational – Student Ambassador and Spousal Employment Program, University of South Carolina Military Education Outreach Program. Come join us and share the pride.